The bodywork consisted from a wooden frame on which a shell made from bent sheet metal was fixed by nails. The rear was rounded, contrary to the twoseater. The car also has only one door which is located on the passenger side and which opens to the front. Contrary on the rhd cars. The doorhinges were fitted invisibly. A tensioned conical bolt reduced undesired vibrations. The spare wheel was fitted on the drivers side, inside out, and fitted with a tyre upon delivery. The drivers seat was fixed. The passenger seat glides on two round rails from the front to the boot where it fits into a bay in the body. In the front there is a folding seat which opens when the normal passenger seat is in the rear position. The trunk is behind the drivers seat and has a deck lid which opens to the top. The running boards are made from aluminium, reinforced by longitudinal ribs. They are black painted, the higher ribs are polished. mudguards and frame cover are made from black enamelled sheet metal. All four mudguards are reinforced by bordures. The sidepanels were provided with pockets. The floor was covered by a black brush-carpet. The dashboard is from aluminium, tap-ground and equipped with instruments. The T3-1 is basing on a C3 chassis with a wheelbase of 2.35m. The running board from aluminium is 170x980mm. The windshield can be inclined and fixed in any position. The pivot point is in the lower third of the column. The hood is fixed on one single axe and made from waterresistant fabric. The hood folding mechanism is made from steel. 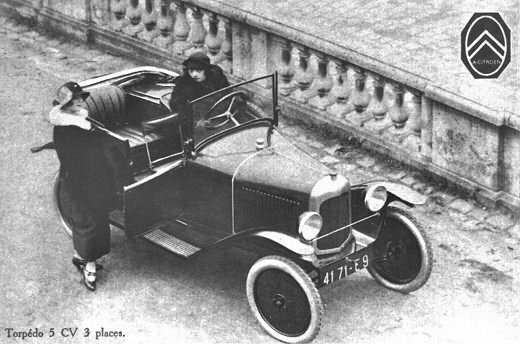 "Le faux Trèfle", as it was called by the french, was manufactured in a total number of only 800 cars, following the Museum La Clayette. In the beginning the car was equipped with high pressure tyres (700 x 80). From June 1924 on all cars were equipped with balloon tyres "Confort" (715 x 115) and the convenient rims. The "Faux Trèfle" was factory delivered in blue canon, red (marroon) and brown (havane). Rims, mudguards, Lamps etc. are black. The exact tone of the colours blue canon and red excelsior is not known at the moment. Black enamel mudguards, frame cover, rims, windscreenframe, windscreen-holders, license plate cover, cover rail, luggage rack. Black skai seats, seatrests, side panels, pockets. Nickel plated radiator shell, lamp rims, lamp connecting rod, steering column, fuel tank cover, decoration rail behind bonnet, bonnet locks.